I just say I'm from Arkansas because I was born in Jonesboro, raised partially in Little Rock, went to Blytheville, back to Little Rock, and then to Hot Springs when I was in the eighth grade, where we stayed through high school graduation before I left for college in Fayetteville. My father was the district commercial manager with Southwestern Bell, back when we really had a telephone company. That company moved people wherever, and it was nothing for us to just pack up our wagon and leave. Dad was usually gone two nights a week, and he made $30 per week in the early days. Up until the eighth grade, most of my time was spent in Jonesboro. We lived on West Matthews in an old, white clapboard house. One of the rooms sloped. We had a floor furnace, which I loved because in winter, I could stand over it, and the heat would roast you! I don't remember having air conditioning at all. I remember linoleum on some floors and hardwood on others. It was a nice little neighborhood near downtown. But Jonesboro back then was such a tiny little place. The telephone company, bank, and utilities were probably the core businesses. When I was in the third grade, we moved to Sherwood Drive in Jonesboro. The house was magnificent, we thought. It was a pink split-level with two bedrooms up and one bedroom down. My brother and I shared the room on the lower level. My two sisters were upstairs, and my baby brother was still in with my parents. It was a typical 1950s family. Dad went to work; Mom stayed home and raised the children. Dinner at six o'clock, and you'd best be at the table on time. After dinner was homework. Breakfast with the family in the morning. We rode our bikes to school. I would call us middle-class for back then. We were Catholic, and we went to a Catholic school in a Baptist town. We made up our own games. We'd act like cowboys — most of the movies were Westerns — or spacemen, because the space program was big then. We'd go to one of my friend's farms, where we could drive the tractor. That was huge. We'd hunt ducks. We got our first TV when I was six, and we were allowed to watch one show: Howdy Doody. We usually had a beagle running around, but pets weren't a huge part of our life. We already had a lot of mouths to feed. The restaurant industry got into my blood in the ninth grade when I went to work at The Lee's, a family-owned restaurant. I fell in love with the food and the atmosphere. It was like a big ol' family. I started out as a dishwasher. It was 85 cents for a meat and three vegetables, cornbread, and a small dish of cobbler. I discovered that I liked feeding people, and I liked making people happy. That's when I decided I wanted to own a restaurant. I earned a degree in business administration from the University of Arkansas, and then the Vietnam War draft forced me into the Navy. I specifically applied to be a food service officer, and I became directly responsible for feeding more than 3,000 men on the aircraft carrier USS Oriskany. I ended up going to Japan, spending Christmas in Africa — I really saw some sights. We won the top Navy food award. The Vietnam War ended. I was aware of three companies that specifically wanted to hire ex-military officers for store managers. Steak & Ale Restaurant was the one I was most interested in. They sent me to Memphis, where Steak & Ale was called Jolly Ox because Tennessee wouldn't allow the mention of alcohol in the name of the restaurant! Then a position at the Little Rock store opened up, so I loaded up my pickup, and off I went. I got mad at Steak & Ale because one night, I was closing down the restaurant, totally by myself, and I got a phone call that told me to take all the money and put it in a blue bag that was hidden in the men's room. I was told to throw the blue bag over the fence behind the kitchen. If I didn't do that, a hidden bomb was set to go off. I ran up to the men's room, and there's the blue bag. I thought, "Oh, hell!" I called the police — who basically blew it off! I was totally locked in, in the store. It was an ordeal for me, but I was never thanked or told that I did a good job. So I left. But that job taught me all the systems in the restaurant industry, down to counting steaks, cash control, stocking the salad bar, and costing. Down the street, a guy was building a restaurant that everyone was talking about. Bruce Anderson was the biggest character in the state of Arkansas. He was going to open a 20,000-square-foot restaurant inside a warehouse building overlooking the Arkansas River. Anderson's Cajun's Wharf in Little Rock was covered in glass on two corners, and you had this fabulous view — close enough to the river that you could almost spit in it. I went to work there as the assistant general manager. On opening day, we had a three-block-long line waiting to get in at 4:30 p.m. The kitchen completely broke down because the general manager hadn't trained the cooks, and there we were with a building full of people and no orders coming out! We gave everyone free whiskey and told them we had a gas leak in the kitchen! But we did $3.6 million our first year, which was a national record. In 1978, I learned about a $650,000 SBA restaurant loan that was available in Memphis. Once again, I loaded up my pickup truck and took off. When we got here, my business partner, Bob Theiman, and I were told we couldn't borrow that money until No. One Beale at Beale Street Landing — which was started with a previous SBA loan — was making money. So what could we do? We took over No. One Beale Restaurant. But we never could make it work right, no matter what we did or how good we did it. Even when we had it running to perfection, it was still losing money. But we did stabilize it. Union Planters Bank allowed us to borrow in order to build Captain Bilbo's. We got the name from Captain Bilbo Williamson, who was to tugboats and barges what Henry Ford was to automobiles. He died unexpectedly shortly before we opened. While that restaurant was operating, four of us decided there wasn't any good Mexican food in Memphis, so we opened Caramba Mexican Restaurant just north of The Pier, near Captain Bilbo's. Salsa, margaritas, San Antonio–style food. But we couldn't get enough volume driven through the restaurant to make any money. It was tucked away and hard to see, but like No. One Beale, I think our biggest problem was lack of parking. It was live and learn, but I'm not sure what the lesson was! No more Mexican restaurants? Before it was all over, I had owned, operated, bought, and/or sold a number of restaurants that included Memphis Petroleum Club. No. One Beale Street, Captain Bilbo's, Caramba Mexican Restaurant, Gonzales and Gertrude’s, Bayou Bar and Grill, and Le Chardonnay. And somewhere in there — in 1982, I believe, I got married to Gina, who I met on a blind date. We raised her son, Derek, who is 35 today. She keeps me in line. In 1992, my vision changed. I decided that we would never be able to successfully franchise the Bilbo's concept, even though it was a very successful restaurant. One day, I got a call out of the blue from a buyer. I sold. During this whole time, my civic work involved child-caring organizations. I enjoyed things like taking a group of Boys Town boys to the Spring River, canoeing down the river, and giving them the biggest time of their life. Judge Kenneth Turner told me that Porter-Leath Children's Center was looking for a manager. I knew they were — at that time — a 148-year-old nonprofit organization that helps children and their families achieve healthy, independent lifestyles. I had been on their campus before, as a probation officer for Memphis and Shelby County Juvenile Court when the emergency shelter was housed there. 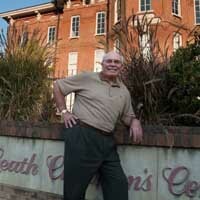 I became Porter-Leath's executive director in 1998. The historic buildings on the property were in terrible shape — and so was the organization, really. I mean, even United Way was on the verge of de-funding us. It took about two years to clean it up. If I hadn't been the German I am, it would have beaten me down, which it almost did anyway. Of course, when you're coming into a situation that is that bad, it's pretty easy to look like a hero to everyone! My full job title today … is president of the Porter-Leath Early Childhood Foundation and executive vice president for development and new business for Porter-Leath. It's just too much title, really! The biggest lesson I've learned at Porter-Leath … is patience. A misperception many people have about poverty … is they think that the parents don't care, that they just let their children run wild while they sit around the house and do drugs. Those parents really do care about their kids. They want for their children the same things all parents want: a safe home, a good school, enough food. The problem is that for people in poverty, every one of them faces a daily crisis. They get so down, they can't pull out of it. The trick to being a successful fundraiser … is accountability. If people trust the person who is asking, that's what really seals the deal. The cause almost becomes secondary. The most rewarding part of my job … is seeing the huge difference we make in families' lives. When I see people who we've helped transition from being unemployed with raggedy, sick kids to having gainful employment, a safe home, and healthy children in our Head Start program — when they tell you how thankful and happy they are, I can't describe it. The part of the restaurant industry I miss most … producing banquets and parties! The part I miss least … the human resources part — managing people. The idea for the Rajun Cajun Crawfish Festival … I had gone to a crawfish festival in Breaux Bridge, Louisiana. True Cajun country! I'd never seen anything like it. Music! Eating! Drinking! A boat parade! I thought, "I think we can do this in Memphis as a fundraiser for Youth Villages!" So we held Memphis's first crawfish festival, and this year was the 18th. Naturally, Porter-Leath is now the beneficiary. The idea for Soup Sunday … came out of Little Rock. Cajun's Wharf, one of our restaurants, was doing a Soup Sunday, so we held the first one here in 1990 inside Captain Bilbo’s, and all the local restaurants participated. When we sold Bilbo's, we told Youth Villages to service-mark this as their event, and they held their 21st Soup Sunday this year. From my mother, I got … a lot of my German traits. Hard-working. Her family moved to Jonesboro from Germany in the late 1800s. Sometimes I can be a little gruff and standoffish, and I like to be by myself a lot — very German characteristics! From my father, I got … my organizational skills. He had the ability to sort things out and compartmentalize, and I do really well with that. I wish I had inherited more of his personality. He was very vivacious and loved being around people. My grandparents … lived about two blocks from us in Jonesboro, and they had a great house! Red brick, huge attic fan, a garden, chicken house, strawberry patch, blackberry patch, pecan tree. They were almost self-sustaining! I used to watch my grandmother can. I loved sitting around with everyone on the back porch shelling peas or snapping beans. And to this day, I do some canning. I'm not very good at … any type of sports. I've always had two left feet. One of my happiest memories at Porter-Leath … a young man came up to me at last year's Rajun Cajun Crawfish Festival and said, "Because you helped me get started on the right foot, I want to make a donation." He gave $5,000! Most people don't know that I … helped create Youth Villages. Jim Pickle with Methodist Hospital and I merged Memphis Boys Town and Dogwood Village. Youth Villages is now a $150 million company. Pat Lawler, its CEO, does a fantastic job! Renovating Porter-Leath's three historic buildings was a priority to me because … they are a huge, important part of Memphis history that needs to be saved. We've got the 1854 orphanage that was built in a cotton field; the 1874 building built after the yellow fever epidemic; and the one I work in was built in 1927. I'm quickest to anger when … people don't take responsibility. It's easy for me to get angry! As a child, I thought I would grow up to be … president of the United States! In retrospect, I probably would have had us at war most of the time! Back then, a good politician made good, common-sense decisions, and that was something I had a knack for. Of course, every Catholic kid at some point wants to be a priest, but I didn't dwell on that very long! I chose the Navy over other U.S. armed forces because … I just figured they had a warm place to sleep and you didn't have to eat what they called "C rations"! You always had your home on your back, so to speak. And I thought it was glamorous! I'd never been outside of the States in my life. My first paying job … was in Jonesboro when I was 11. Mr. DeWitt at the local YMCA paid me $12 a week to work in the concession stand. All the Cokes were in glass bottles — worth two cents deposit. I'd go around the grounds collecting bottles and cashing them in! Of all the restaurants I've owned and operated, bought and sold, the one closest to my heart is … Cajun's Wharf in Little Rock. It's still there. I focused my initial restaurants Downtown … for the exact same reason I came to Memphis: There were loans to be had if you built Downtown. The main difference between running a restaurant and running a nonprofit … I think they're exactly the same because I take the management viewpoint: You get things organized and make people accountable. Any business you're in, if you stick to the basic principles of management, you'll probably have a successful organization. I chose to focus on children for my civic involvement because …my own childhood was so beautiful. I had a family I could trust, friends I could depend on and play with. I went to a great school and everyone knew each other. I transcend that and think, "What if I'd not had all of that? Where would I be?" My greatest extravagance … a Grey Goose martini now and again and a monthly massage! When I sold my last restaurant … I was kind of sad about it. The worst of it was that I had all these loyal employees who — despite the new owner's promise otherwise — were dismissed after I sold. But I knew it was time. All the stars had aligned. One of the toughest periods in my life … was a turnaround project at Monday's Child, Inc., a children's clothing manufacturing company. The young owners had been killed in an accident without a contingency plan for the business. It was a mess. We had a wonderful staff, but the industry changed, and the store's target audience evaporated. So I had to liquidate that whole thing, and for the first time in my life, I was unable to pay people the money I owed them. The battle I get most tired of fighting … is over turf. Everybody is "turf-y" — especially non-profits. They want to protect their little area; they don't want to share. They don't understand how to work for the common good. I get most discouraged when … I deal with government. I never thought I would … go to Russia. That really came about because of boredom after I got out of the restaurant business. A friend had started a food distribution company over there. His theory was that there would be a huge, emerging middle class in Russia, and he asked me to go over there to run it. I reorganized their distribution and inventory system. Before I die, I … want to complete my bucket list — and yes, I do have one! My final 2 cents … Everyone needs to give back. It takes teamwork to move forward, and outcomes are the reason for celebrations.